James Robertshaw was the only Bollingtonian known to have fought in Wellington’s army at the Battle of Waterloo (19 June 1815). We know this because his relatives were good enough to record the fact on his gravestone. 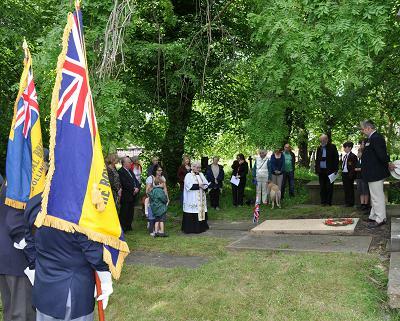 On 19th June 2015 thirty adults and children assembled at his grave in St John’s churchyard and held a remembrance event which included British Legion flag bearers, prayers from the vicar, Canon Veronica Hydon, and the laying of a wreath which had been made for the occasion by the children of Rainow Primary School. The event was organised by Cllr Alan Williams, chairman of Macclesfield and Bollington British Legion, who had also arranged the thorough cleaning of the grave stone. As with all military graves in the churchyard, a small Union flag flies over the grave at all times. 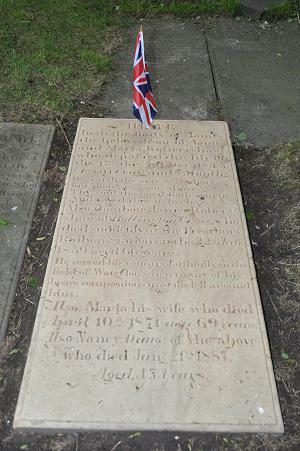 James Robertshaw survived the battle at Waterloo and lived out his life at Bollington Cross. He died suddenly at Prestbury railway station on 22nd January 1859, aged 66 years. 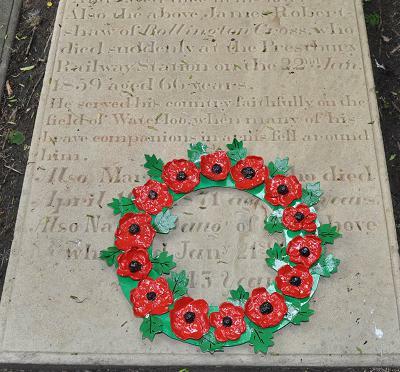 An act of remembrance was held at the graveside on 19th June 2015, the 200th anniversary of the Battle of Waterloo. The relevant part of the lettering on James Robertshaw’s gravestone, together with the wreath made by the children of Rainow Primary school. “Also the above James Robertshaw of Bollington Cross who died suddenly at the Prestbury Railway Station on the 22nd Jan 1859 aged 66 years.